On May 27, AOA topped KBS' "Music Bank" with its new song "Good Luck," pushing back Twice into the second place. By the way, this provoked a fierce controversy among the public. Some of you might not understand why, but there's a reason for that. Ok, before looking into the reason, let's see how the big 4 kpop chart shows choose their No.1 of the week. As you can see above, "Music Bank" chooses its No.1 of the week by totaling digital single, album sales, broadcast and preference points. Then, let's see if AOA deserves the No.1 trophy. 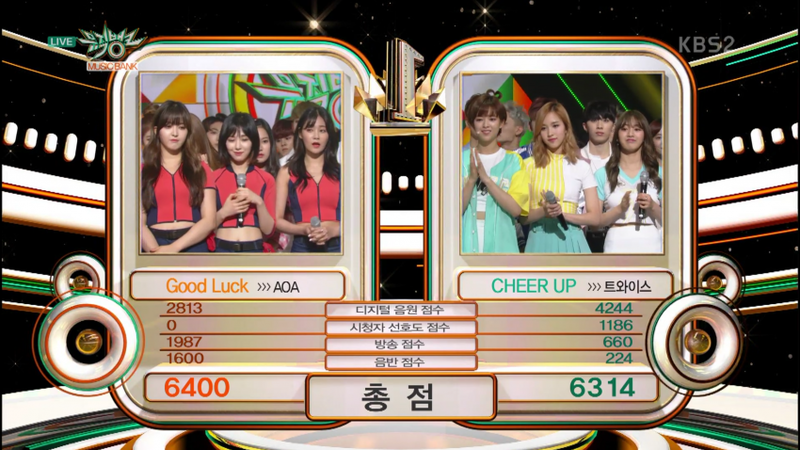 Here's actual points of AOA and Twice. However, what about album sales point? 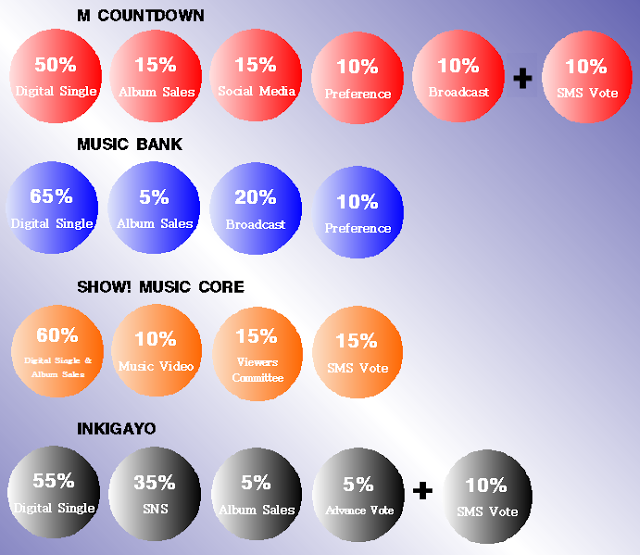 Here's last week's album sales of kpop singers and how "Music Bank" scored. AOA got 1600 points with album sales of 20,900 copies, while Monsta X got only 990 points with album sales of 19,500 points. Do you think this makes sense? Well, as I mentioned before, when determining No.1 of the week, broadcasting companies do a lot of thinking about it because they need to maintain good relations with big kpop agencies, which means music chart shows are not always about kpop singers' popularity and achievement. FNC has many idol stars who are active as actors like FT Island's Hongki and CNBLUE's Yonghwa, while top comedian Yoo Jae Suk also belongs to the agency. KBS has various dramas and entertainment programs, and the broadcasting company really needs FNC's stars. Of course, nobody has evidence about kind of "deal" between FNC and KBS, but it's true that the whole thing seems very suspicious. **Plus, KBS is a public service broadcaster and people in KBS are public officials. Personally I think most of Korean public officials are very lazy because of their lack of motivation. I don't think staff members of "Music Bank" work very hard, and I consider "Music Bank" as the most unreliable program among the big 4 music chart shows.